This weeks Top Ten Tuesday list (weekly meme hosted by The Broke and the Bookish.) 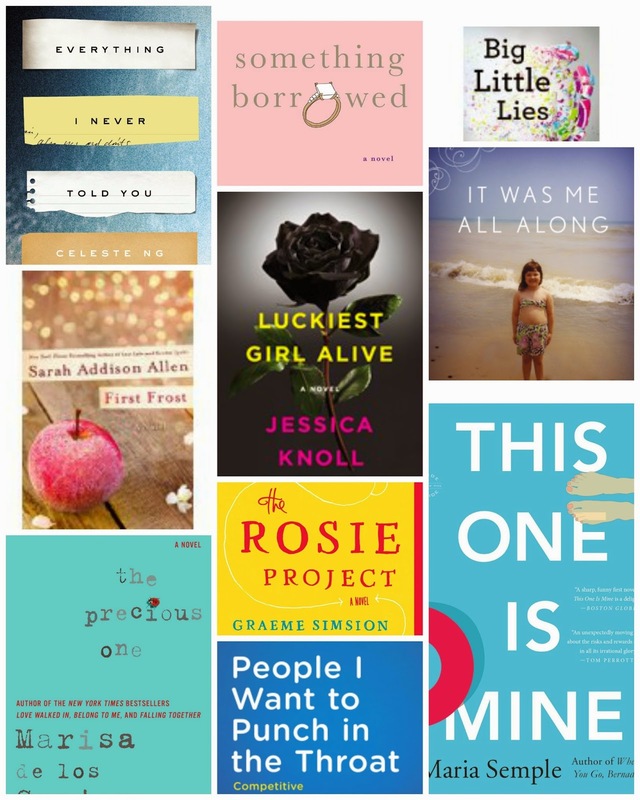 is the Top Ten Books I'd Love to Read With My Book Club/If I Had A Book Club. Do I want to belong to a book club? Not really, I feel like all the book blogs I read are my own virtual book club, where I can participate in my pajamas - BONUS! sequel. I've been waiting a long time to read this, and I would totally love to talk about it with people who loved it as much as me. 2. It Was Me All Along by Andie Mitchell. I'm not normally a big fan of biographies, but this one was just amazing. Andie Mitchell is a blogger who has a lot to say. I think her message speaks to anyone who has struggled with self-esteem, ie; 99.5% of women. This would be a great book to help women start some difficult conversations. 3. The Rosie Project by Graeme Simsion. Easily one of my favorite books last year. A truly unique love story - and the sequel, The Rosie Effect, was just as good. Lots to talk about, the main character has Asperger's and watching him trying to navigate his feelings for Rosie is amazing. I know that I would love discussing it, because I pretty much forced everyone I know to read it. 4. The Luckiest Girl Alive by Jessica Knoll. This book won't be published until May, but I'm going to make everyone read it. It was amazing. Definite page turner and a great read for parents, it makes you worry about how your kids treat their schoolmates. 5. This One is Mine by Maria Semple, The perfect book for a mid-life crisis book club. It was the kind of book that made you feel too much, but made you laugh at times too. It's definitely one I wish I could discuss with other people to see if it affected them as deeply as it did me. 6. Everything I Never Told You by Celeste Ng. I haven't had a chance to read this yet, but everyone has raved about it. I can't wait to read it. 7. Something Borrowed by Emily Giffin. I loved this book, even though I didn't love the movie. I think this would be a great book club discussion, with lots of different opinions. 8. Big Little Lies by Liane Moriarty. You never know what goes on behind closed doors. But at least no one at my book club would be murdered. I think. 9. People I Want To Punch in the Throat by Jen Mann. Yep, I could use this as a book club pick, because I wouldn't be friends with any competitive crafters. And it's hilarious. 10. The Precious One by Marisa de los Santos. I would love to discuss this book and the complicated family dynamics of a father who abandons the kids from his first family, to become the perfect father to his second family. Anyone want to discuss these books? Andie Mitchell's "It Was Me All Along"